We have some dilemmas with an interface here in Moodle 2.0 for managing media files within HTML documents. Feel free to add new ideas to the document or just reply to this discussion. Current file manager and file picker is not compatible with subdirectories in file areas. Listing of files is relatively easy, the tricky part is how to choose where you want the picked file to land. Depending on what type we choose we might have to implement it in both file manager and file picker somehow. The popup file manager could be also linked from the filemanager formslib element. I guess that could solve the subdirectory issue, unzipping, etc. I think we should implement both full current files support in picker and also pop-up file manager. The text editor integration should be flexible enough to allow multiple image plugins installed at the same time. Administartors could define several editor set-ups and users could then specify which set of plugins/icons they want or even switch set-ups on the fly. What do I vote for? Combination of B and C and at the same time giving contrib developers an option to create new A image plugin easily. Users should have an option to specify their own preference too. Sending a mockup of merged B and C.
PS: hmm, there should be Unzip command insted of Zip and maybe Resource content area name which is more likely to contain subfolders. In the context of Martin's initial question: I liked the C approach . I have learned how to use the picture icon to manage files and folders rather than go to the course files link. From a transition point of view, I think C offers more options and the old stick in the mud(s) will still have something that looks and acts familiar. Appreciate all the thought that goes into this kind of thing. At the moment, I can barely grasp the filters and or link buttons that will go to places or view certain file types in a search for linking. Need to get my hands on it. The transition is important, a piece has to be there that looks similar to "the old way" of adding and linking files in a content area. In my design it could be one or two icons in fact, it is just one extra embedding parameter which tells - first, second or both tabs present in that popup. Something like Photoshop and Illustrator rolled into one would be nice for some. Ah, I got to go back and read some more and take in the file manage concept. Or leave the field to those who know better. there are APIs for each service. so, after editing we can upload the image back to moodle. Thanks, Martin, for pointing me here. Oh, a need for design. Oh, but not a chance. If only there was data about what the dialog is most commonly used for. To make a bunch of guesses like everyone does, the basic use case is pretty simple: Primarily give users a chance to just pick an existing file from their computer with as little fuss as possible. Other alternatives, such as getting images from other servers are important, too, but in any case the most prominent first step should probably always be uploading. It will take time for the general public of web users to learn to expect that "adding an image" can also mean getting a file from server B (flickr or whatever) to Moodle server A: most users are not aware of the concept of a server, to start with. Most of the time people expect an 'add image' button to allow uploading something they already have. Make this dead simple. The next step is to optionally define the properties of the image, such as the ALT text. Sometimes people may want to find just any suitable image (search flickr) or use something shared in their group/classroom/school. The Wordpress dialog I uploaded screenshots of seems to meet these priorities quite nicely - although Moodle needs to extend that model by having multiple repositories. See: http://demo.opensourcecms.com/wordpress/wp-admin/page-new.php (user:admin, password:demo). It also supports prominent enough deleting of files from the server. In general, if I were brave enough, I would suggest mimicking Wordpress' version of tinymce and everything related, since they just seem to have so many things taken account and in balance, and are in general praised for usability. Even copying their TinyMCE (especially the toolbars) and file uploading dialog seems a good starting point for our design. Also, do profit from the fact that media items can be selected: when this happens, provide an option (a button overlay on a selected image) to edit its properties - the user case here is different, so we probably should not have the same dialog but a simple one to just modify the properties and a button to switch the image for another. Sidenotes: Visibility of system status, Error prevention (heuristics): When the number of files to attach is limited (such as in the forum), do not make users go through the file picker and find a file to find and only then tell them that their work was in vain. When the limit is full, "Add" link should be removed, and a text explaining that the limit is full should replace the link. Also, in the file picking dialog, the label of the command button to finally select a file (and closing the file selection window) should be a context-sensitive command - "Add to document" for adding the file finally found to the document the user's click originated in, but something else for another context ("Add attachment to forum post"). This helps users stay aware of the context they are in and the task they were doing in the first place, since the file picker is quite engaging in itself. 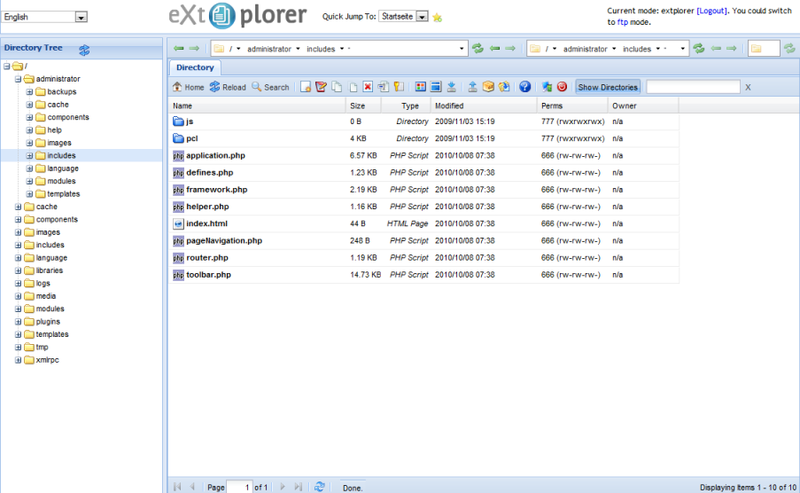 Also, the disappearing of the file picker does not come as a surprise (like it does now) when the target of the command is mentioned in the button: when I click "add to document" I expect to see the document, when I click "select this file" I expect the file to merely become selected for further action. Thanks for the thoughts and thanks for pointing out the Wordpress example. Wordpress has a much simpler task because it generally has one author posting blogs with images, video and sound. Moodle needs to manage all kinds of files, including hierarchies of html files or word documents, for example, as well as attachments. Moodle has to be able to support the many new types of repositories (with browsing and searching) that we want to support. Finally we are trying very hard not to modify core TinyMCE at all (just adding plugins), so that we avoid the forking problems we got into with the old HTMLarea in Moodle 1.x. For all these reasons the filepicker part where you choose a file to use is separate from the settings and preferences about where the file actually ends up. So I can't see the filepicker that we currently have in 2.0 changing much in functionality, we just need to fit it all together in the best way. However, I do agree with the priority list and your sidenotes. And yes, I totally agree that good data would be very useful, unfortunately it looks like we need to create some draft solution first so that people can understand the full extent of the issue in practice. I think this adding-plugins-approach is the best way to go if we want to be able to update TinyMCE regularly in the future. The pluggable editor system that Petr added allows also different configurations for several editors with different plugins so we don't necessarely need to have / show same editor plugins for all users. This plan seems to hit all the requirements and keeps things simple so it's the one we're going ahead with now. I usability tested the design. All eight of my test subjects were lost at some point of trying to upload an image to a document in TinyMCE. Some of the issues are easy to solve and are pretty obvious from the problems users were having. The basic issue is though that there are just too many steps. This blog entry will later likely be copied to Moodle Docs. I will also list the solutions I think are feasible, as soon as possible, at MDL-16597 . Thanks for the testing, Olli, but I'm not clear what interface you were actually giving them. Were you testing with the interface currently in HEAD or the future interface proposed in the spec? It seems to me that this is very close to what was in HEAD both before and after I got latest changes from CVS HEAD on Saturday. Added this note to the blog entry. 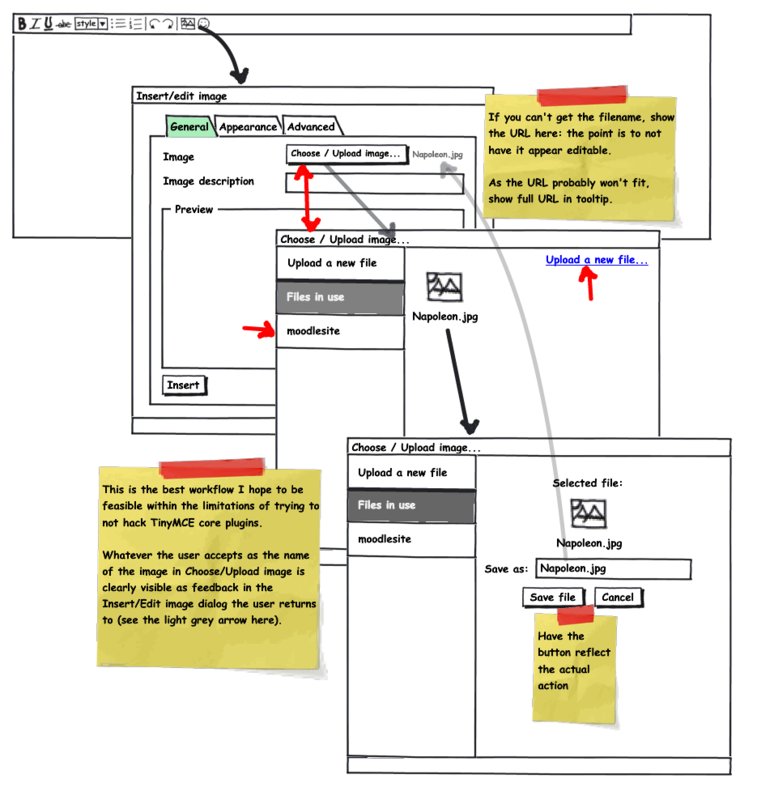 "Except for the [Choose...] button in the Insert/Edit Image dialog, this diagram/mockup is a very close image of the functionality in Moodle 2.0 HEAD I tested." I think that button will improve things (the current tiny graphic that TinyMCE provides is obviously not easy). But otherwise, any ideas about improving the workflow/wording/fieldnames of the other steps would be welcomed. i saw the new file picker some time ago (since, i am working with a local moodle 2 dev version, fixing hebrew issues) and i personally like it allot. we teach K12 teachers (Israel) how to use moodle and how to build courses, on a face-to-face tutoring sessions (classes). so we have the luxury of teaching them what is the right sequence of actions you need to take when adding a new image to an HTML text box. and not have them use intuition to figure it out. actually shows what they do not like to do. and get confused doing. and it is too complicated. (sorry) no for me but for a regular user. here is a link to them: http://www.tikshuv.org.il/moodle/contrib/mod/resource/type/ (if you like to try) and the file upload is uploading an image into the course's file repository with one click. quick and simple. no questions asked. they want it short (sequence of actions) and similar to what they already know. (that is what i am told by all the Teachers, Professors and Drs i teach to use Moodle. i suggest we add a new button to the html editor toolbar for "instant file upload" and embed. no question asked. nothing. the uploaded file should be place in the course main storage folder and all its properties set initially as best we can. if they want advanced file upload... this is another button.